USB 3.0 was a huge advancement in the data transfer era. The data transfer speed for USB 3.0 is 10 times that of its predecessor USB 2.0. USB 3.0 needs dedicated USB ports which are blue in color. Most systems support it as of present. It doesn’t mean that USB 3.0 won’t work with USB 2.0 posts or vice-versa. The only consequence would be that the transfer speed would be of the lower unit, eg. if we connect a USB 2.0 device to a blue USB 3.0 port, it would only allow speeds of USB 2.0. USB composite device is an older USB device and might not work with USB 3.0. While this error suggests that the USB device should not work with USB 3.0, we know that is not the case. External USB devices load their own drivers when they are inserted and detected by the machine. This makes it difficult to update the drivers since the USB is not being accepted by the system at the first place. Our best bet at the resolution is to download the drivers from the manufacturer’s website and install them on the system. Try connecting the USB device after that and check if it works. 1] Press Win + R to open the Run window. Type devmgmt.msc and press Enter to open the Device Manager. 2] Scroll to the Universal Serial Bus Controllers drivers and expand that list. 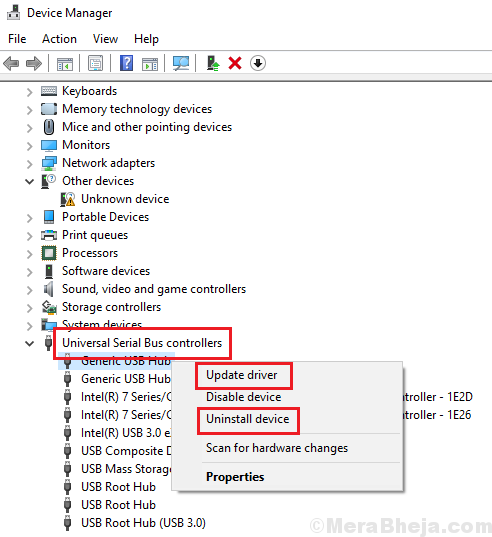 Right-click and update each of the USB controller drivers. You might also consider uninstalling the drivers and restarting the system to reinstall them. In case you are connecting devices like printers, they would have separate cables to connect the device to the port. You could change the connecting cable and check if it works.